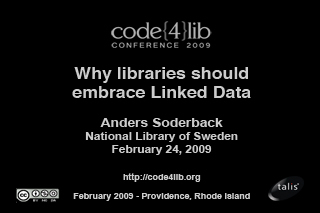 The promise of Linked Data is not that it is another way of aggregating data. For too long have library data been trapped within data-silos only accessible through obscure protocols. Why is access to library data still an issue? Letting everyone access and link to library data lets anyone build the next killer app. LIBRIS, the Swedish Union Catalogue is, since the beginning of this year, available as Linked Data. We discuss how and why.